Dr. Seuss movie at Murphy Library this Thursday, July 23 at 6 p.m. Imagine a world without trees where even breathing is a chore and a 12-year-old boy who lives in it. When a girl he likes tells him her wish to see a real tree, he goes all out to find one for her. Along the way, he encounters a grumpy creature that had tried to save those trees many years before. This Thursday at 6 p.m. the Murphy Library is showing The Lorax a 2012 film based on a story by Dr. Seuss that celebrates an environmental hero, another one of the library’s Summer Reading heros. The film is rated PG and running time is 86 minutes. Voices include those of Danny DeVito, Zac Efron, Taylor Swift, and Betty White. It’s 1934 Cincinnati and a ten-year-old girl believes she is the one to write stories her newspaper will want. She sees stories all over thanks to the Great Depression. The Murphy Library is showing Kit Kittredge: An American Girl, a family film based on an American Girl book starring Abigail Breslin, this Thursday at 4 p.m. and 6 p.m. The film is rated G and running time is 101 minutes. The young girl’s father has lost his job and goes to Chicago to find work. Her mother stays and takes in boarders. That is when the fun starts. Miss May Dooley (Jane Krakowski) is a dance instructor, and Jefferson Berk (Stanley Tucci) is just what you need in the Depression: a magician! Best of all, there is someone near and dear to our library-loving hearts. Lucinda Bond is the mobile librarian, played by Joan Cusack. Thanks go to librarians Debbie Whitener and Trudy Morrow for good driving in our bookmobile! For details about the movie, call 837-2417. And parents can bring their girls back to the library on Thursday, March 12 at 6:00pm, Youth Services Librarian Bridget Wilson will host: Molly: An American Girl Party for girls ages 5 & up. To celebrate anyone who has sent a loved one off to war, the Murphy Library is showing a special film this Thursday at 6 p.m., Little Women. A father goes to fight in the Civil War leaving his wife is left to care for their four daughters. But Meg, Jo, Beth and Amy find joy playacting in the attic room they call the garret. Susan Sarandon, Wynona Ryder and Gabriel Byrne star with music by Thomas Newman. The film is rated PG and runs 115 minutes. At first glance this is an old-fashioned story, but war brings burdens to families whether it’s the 19th Century or today. Fathers (and now mothers) leave for battle with their families waiting at home. All those stories of courage are honored in this film. Youth services librarian, Bridget Wilson, is also honoring this story with a special party Thursday, December 11 at 6 p.m. in the library’s meeting room. Mothers and grandmothers are encouraged to bring their girls ages 9 and up. Call the library at 837-2417 for party details. Parental alert! Murphy Library to show movie for picky eaters this Thursday at 6 p.m.
A new boy in school makes a bet about what he will eat, and it’s not home cooking. The Murphy Library is showing How to Eat Fried Worms, the perfect movie for picky eaters, this Thursday at 6 p.m. Running time is 98 minutes for this PG-rated film. Billy is the new kid in school and his rule for his mother – no mushy notes in the lunch bag. But a school bully named Joe and his friends sneak earthworms into Billy’s lunch. Billy boasts he can eat ten worms and there is no going back. The book for this movie was written by Thomas Rockwell, son of Norman Rockwell, is in the Murphy Library. Because it deals with eating worms and that grosses some people out, it has been the target of book censors. This fact is only noted here as an inducement for kids to read it. The Murphy Library is getting the blues this Thursday at 6 p.m. The Murphy Library is getting the blues with its summer reading film, but don’t expect to hear jazzy music. Thursday’s film at 6 p.m. is The Smurfs, about the tiny blue people who are only three apples high. The film is rated PG and running time is 101 minutes. They live happily in their magical mushroom village, but one terrible day an evil wizard chases them down a watery hole. They soon emerge in a strange forest called Central Park. They’re in New York City! Life is not easy in the Big Apple when you are only three apples high. Then a nice young couple expecting a little one of their own walks by. Perhaps these kind people will fight the evil wizard and the little blue people can go home. Call 837-2417 for details. Murphy resident Becca McNabb and her two-year-old daughter Vivian are fans of Story Time on Mondays at the Murphy Library. They also like the Scholastic Book Fair running from September 5 through September 18 at the library. Call 837-2417 for details. Vivian McNabb is 2 years old and that is the perfect age for the Murphy resident to visit the Murphy Library, especially Story Time on Mondays when Youth Services Librarian Bridgett Wilson shows young ones the magic of books. 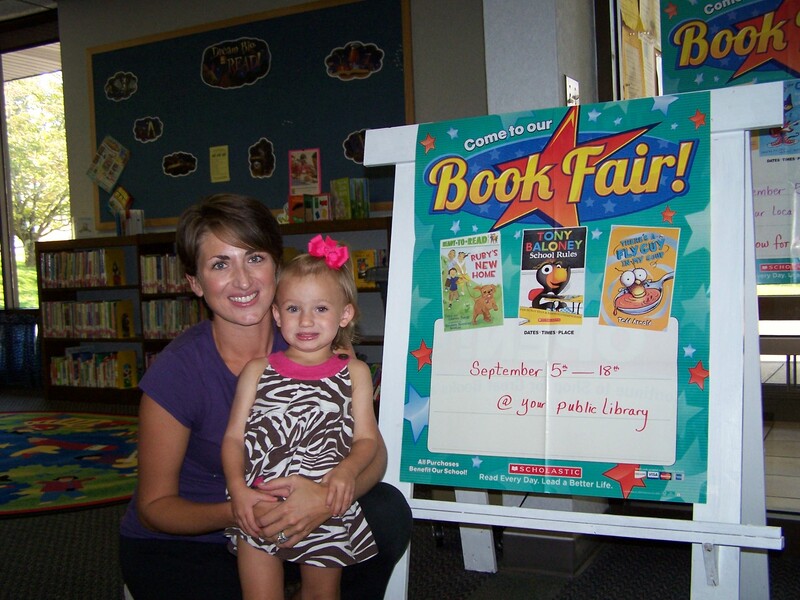 Vivian’s parents Becca and Lawrence McNabb understand how important it is to start children reading early. There will be no movie at the Murphy Library this Thursday, March 17. Storytime dinosaurs are taking over the Murphy Library’s meeting room thanks to the efforts of Bridget Wilson, Nantahala Youth Services Librarian. She is holding a “Dinosaur Pajama Storytime” for all ages on Thursday from 6:30 to 7 p.m. Want your young ones to join the fun, call Bridget at 828-837-2025. 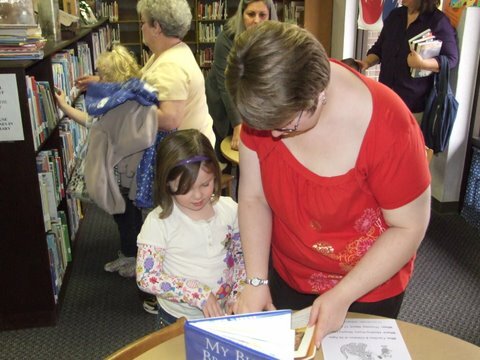 Youth Services Librarian Bridget Wilson shows young reader Anna Coffey one of the new books at the Murphy Library. Bridget will be reading about dinosaurs this Thursday at a special Dinosaur Pajama Storytime at 6:30 p.m.